PICTOGRAMS, CLIPARTS, ANIMATED GIF, etc. e-mail url : www.dessindepresse.com - Visit also cartoonevent.com! Born on July 7th 1976, I spent my childhood in Francorchamps, then in Stavelot in the heart of the Belgian Ardennes, a region of woods and hills next to the German boundary. Sports, walks in the nature, comic books, scouts, drawing and other passions filled out my free time. After a mathematics-oriented secondary school , I began Communication Studies at the University of Liège, and then Journalism. In the last year, when I was already cooperating to the Student Union, the Youth Parliament and other sheets, I met the most popular Belgian cartoonists thanks to an essay dedicated to caricature. Finished in June 98, it was rewarded by the CLIRP and constituted the basis for the big exhibition "Coups de crayon" (Liège, ING, March-April 2000). After one year of travels and various experiences, I decided to work as a free-lance cartoonist for papers and internal press of companies. Now, I am working for firms, organizations and associations, in Belgium and abroad, that chose to dynamize their communication by humoristic illustrations. I create editorial cartoons, posters, computer assisted drawings and logotypes, illustrations for websites and also provide event animation via caricatures made on the spot during meetings, congresses, formations, parties, etc. (see http://www.cartoonevent.com). I also dedicate my time to photo restoration (see http://www.photolifting.com). My clients seem to appreciate 1) my originality and my ability to summarize many and/or abstract ideas; 2) the combination of dynamic hand made lines and a computerized soft colorization; 3) the positive and pleasant tone of my creations as opposed to vulgar or aggressive drawings delivered by some satiric papers. These 3 elements contribute to give a good efficiency to cartoons and insure the editors or the communicators to have a positive feedback from the audience. The website dessindepresse.com presents various styles of illustrations, my collaboration procedure, legal conditions, details about copyright legislation, an order form and advices to optimize the use of cartoons. If my signature can nowadays be found in several companies and institution networks, in Belgium and beyond, this is first due to the practice of drawing since an age I can't remember. An enthusiastic and curious character, a specific knowledge acquired during my Journalism Studies and a spirit of analysis improved during nearly 6 years of experience as free-lance, guarantee a reliable and constructive service in order to dynamize your communication. I also know my limits and I would let you know immediately if my competences can satisfy your demand or not, or to which extent. 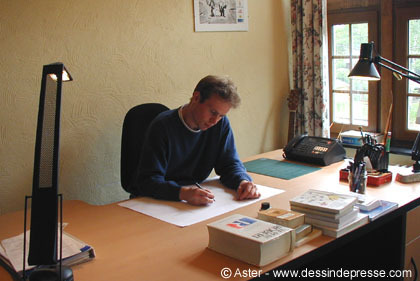 To finish, and because "good drawings are better than a long speech", I wish you to enjoy the visit of dessindepresse.com, website dedicated to the editorial cartoon and cartoonevent.com, introducing animation by live made caricatures.